Check out the cool collection image of Grape, Berry and other Fruit easy Halloween costumes we’ve created by Pinning this to your board! This was an easy Halloween costume that I thought of. My friend and I were raspberries! 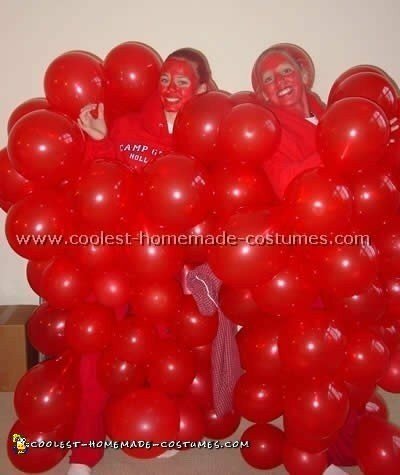 We wore all red and safety pinned red balloons all over our bodies. Also add in the face paint and you will be looking yummy as can be! This was so much fun. All you need is red balloons. Everyone will want to pop your balloons! For this costume, I purchased a black sweat suit consisting of a hooded sweatshirt and sweatpants. I hot glued a cording on the front of the sweat suit to look like the vine of the grapes. I purchased a few packages of deep purple balloons – you could also go with a green sweat suit and green balloons if you choose. 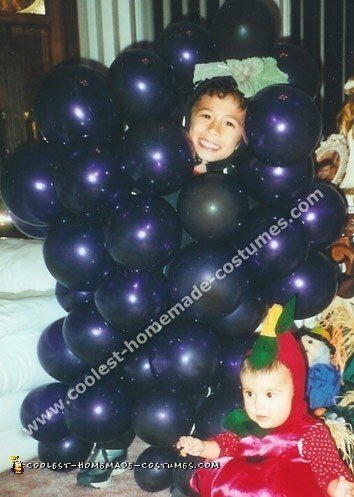 I had to blow each one up, then I fastened each balloon through the knot on the top of the balloon with a safety pin to the sweat suit, I put them randomly mainly in the front of the suit, making it possible to sit. I purchased plastic grape leaves to fasten on the top of the hood; again I used a safety pin to fasten. I purchased a black mask to cover the face a little (but he is not wearing it in this picture). It is an easy Halloween costume, unique and not too expensive. It was a big hit at the school Halloween party (The strawberry costume was not handmade, it was bought through a catalog). These are the cutest Cat in the Hat costume – Thing 1 and Thing 2.